Yamaha has built two sweet-looking XSRs to star at the Throttle Roll street party in Sydney, June 12. The LAMS XSR700 appearing at the event is inspired by a DT1 enduro and is complete with knobby tyres, brushed aluminium guards and a retro paint scheme. The RZ250/350 is the inspiration behind the inline triple XSR900 – gold wheels, retro white and red paint scheme. Both models are prime examples of what Yamaha is calling sports heritage and show off how easily the bikes can be personalised – and they look trick! Yamaha is also giving away a Segura leather jacket valued at up to $800 – post a selfie with the XSRs to Instagram tagged #throttlerollXSR for you chance to win. 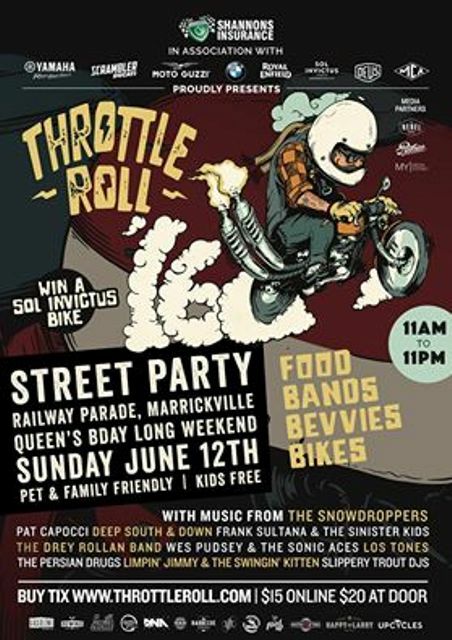 Throttle Roll is an event which blends a custom bike show with music. The event is organised by Sydney Café Racers – the same people who run the Distinguished Gentleman’s Ride. The event will run from 11am to 11pm at Railway Parade, Sydenham. Those from overseas will recognise the XSRs as a variant of the FZ-07 and FZ-09, more commonly known as a MT-07 and MT-09 in Australia.